The journey through the mountains of Nepal sums up exactly how it is – ‘little bit up little bit down’. We were heading towards Jyamrung, a village high up in the mountains near the district of Dhading, with a karyakarta, Shri Virendraji (National Director of Operations – Jankalyan Pratishthan, the partner organisation of Saraswati Vidyalaya/ 3R’s Education Trust, UK), who stayed with us throughout. There was no conventional road going up to the village, the car struggled a seven-hour rocky path until it finally gave up. Within minutes the entire village came together to get us out of the ditch. 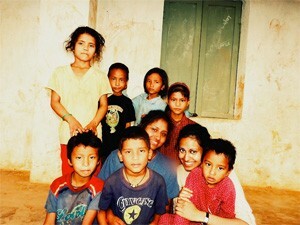 It occurred to us then how the whole village was a family and we wouldn’t be missing home anytime soon. We were welcomed by an extravagant swaagatam (welcome) where all the village children showered us with flowers and garlands. We met the Ekal Vidhyalaya karyakarta of Jyamrung, Nandakumari, whose house we stayed at during our time there. The rest of the villagers, who over years had built their own community high up in the mountains, were simply fascinated by having outsiders staying with them, since it is rare for them to even have visitors from other places in Nepal, let alone from England! We had experienced living in villages in India, so we thought this would be a piece of cake, however we were shocked at first to see just how remote the village was. There was no electricity, no fans, no hot water, but we adapted and the torch was our new best friend! Not having any hot water was no longer an issue, as we were thankful for the cold showers to wake us up every morning before school started. The term shower should be used lightly, as it was actually a bucket of cold water and jug. We even brushed our teeth in the communal washing area, which was a stone square with a hosepipe also used to wash clothes and dishes. That is when we discovered the network of water pipes connecting the water supply for the whole village. It was refreshing to see how environmentally conscious they all were using valuable resources just to fit their need, so much so that in the second village there was no enclosed shower at all. We fashioned one with bamboo sticks and a plastic sheet with a hosepipe pierced through. Our construction was put to the test when heavy rain and wind attacked it the following day, which resulted in us living like locals showering outside with the rest of them. Everyday we woke up to the most amazing scenery. We were surrounded by the Himalayan mountain ranges, and it simply took our breath away to step out of our hut and take in the vast landscape. We would have our breakfast, which consisted of a more than generous helping of rice, which we also had for lunch and dinner, for two weeks! It was really nice for them to go out of their way to make roti for us, something that was very alien to them that they had to roll it with a steel glass. It made us realise how they would do anything to make us comfortable and feel at home. We even found ourselves an English to Nepali translator by the name of Ramprasad, who is a secondary school student from the village. We came to know that everyone there only spoke Nepali and he was more than happy to take on the task to translate for us. However within a few days, we had picked up the basics and were having conversations mixed with Hindi, English and Nepali, not to mention sign and body language, which became vital in understanding one another. The school itself is known as Ekal Vidhyalaya, or one teacher school, where by day the children are taught English, Math and Nepali between the ages of three to ten. During the evening for two hours, they have shakha consisting of reciting prathna, mantras, doing yogasan and khel. The village shikshika was Sita didi, who like everyone involved in Ekal Vidhyalay, voluntarily runs the school along with farming and her daily chores of taking care of her home and family. In the mornings we took Math and English Classes. It was shocking to find that children at the tender age of ten were doing trigonometry with their eyes closed! English classes were amusing to say the least; we had fun teaching them role-plays in English, which they responded very well to. In particular, playing khel (games) was the highlight of their day, as these children don’t only attend school but also help their families by tending to crops, animals and other household chores. It made our day just to see their faces light up when we taught them countless games, which reminded them that they are still kids. Even when the monsoon rain interrupted our khel, we all took cover under the tree house and continued to play. Every night there was Satsang (spiritual & cultural singing) where all the village people came together to sing bhajans, Nepali songs and even do the traditional dance. They were all farmers, who spend their life doing hard labour and live off what they grow, they don’t have much and it was uplifting to see them all sing and dance, and not once did we see their smiles falter. They were so enthusiastic that even we were pulled to join in, and although we tried our best we still believe they were laughing at us as opposed to with us! For two days during our stay we were joined by other Ekal Vidhyalaya shikshikas (teachers) from other villages who were all young, from the ages of seventeen to twenty. Even though they were either students or working, it was inspiring to see how eager they were about Ekal and their energetic approach to the work. The children are really lucky to have such willing teachers to take this responsibility so open heartedly without expecting anything in return. Within minutes we found ourselves laughing, taking photos and exchanging numbers with them. This can alsoVyayamyog be said for the other village kids who were our age, who were hesitant to even go to school because they wanted to show us the sights of the mountains. Nevertheless we did find time everyday to go somewhere new, and we would all walk around 5km under the strong Nepali sun and humidity, but this was all worth it because the scenery of the Nepal Mountains can’t be compared to anywhere else in the World. It was a whole a new experience sitting on the edge of the peak with our new friends blasting Nepali music! Before we knew it, we were no longer outsiders, but in fact one of them. We were living like them, speaking Nepali with them, eating with them, laughing with them and in the end it became very hard to part with them. It was exactly the same feeling regarding the local karyakartas (workers) who were with us and were all from a different part of Nepal, yet we were all brought together in the name of Ekal Vidhyalay, under the auspices of Jankalyan Pratishthan & Saraswati Vidyalaya/ The Three R’s Education Trust of UK. 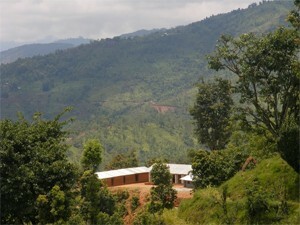 In the UK the Ekal project in Nepal is undertaken by Saraswati Vidyalaya (SV). SV is the service project of Three R’s Educational Trust with its head office in Nottingham. The address is: Saraswati Vidyalaya, Environment House, 6 Union Road, Nottingham, NG3 1FH, Reg Charity No: 1103125.